Investigate the attributes of a silver maple if you are searching for a rapid growing and inexpensive ornamental shade tree species. The silver maple fits this description and is a widespread species, found across much of the eastern part of the United States and typically available in nurseries. Acquaint yourself with the pluses and minuses of the silver maple before making it your choice to fill an empty area of your yard. Identify silver maple trees by such facets of the species as its trunk, bark and leaves. The trunk of this tree is short and stout, even though the silver maple may grow to be as tall as 80 feet. The bark is a silver-gray color and the leaves are a dullish green on the upper side and a silvery-white shade beneath. 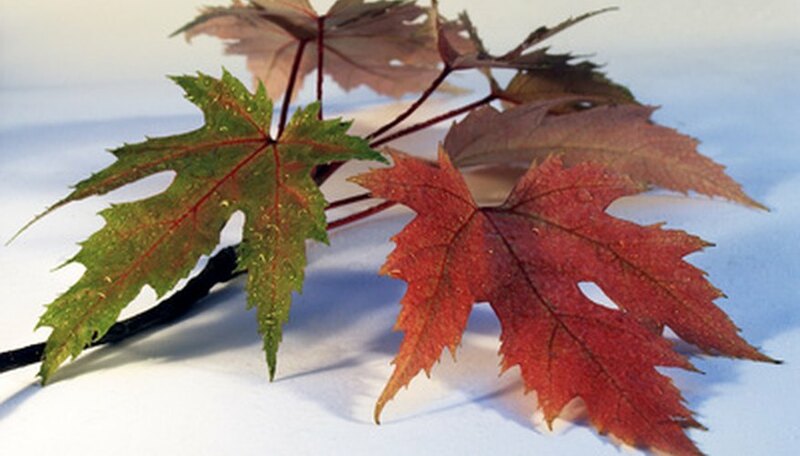 The shape of the leaves will grab your attention, as each leaf has five deep lobes, much more pronounced than the typical maple leaf. The flowers are a dull red and turn into winged seeds called samaras by June. The leaves change to yellow colors in the fall. The geographic border of the range of the silver maple extends from northern sections of Maine and into the rest of New England before straying away from the Atlantic Coast. This maple grows in northern New Jersey and Maryland into western Virginia and the western part of the Carolinas. Northern Georgia and almost all of Alabama and Mississippi have silver maples and the tree’s western boundary goes into states such as Oklahoma, Nebraska and Kansas. In the northern part of the silver maple’s range, it grows in southern Minnesota, Lower Michigan and all around the Great Lakes into southern Ontario. Mull over some of the problems you may encounter with a silver maple before rushing out to buy one. Consider the shallow roots, which will not grow under your sidewalks or driveway but right into them if you plant the tree too close. Take into account the roots can access drainage systems if planted in their vicinity. Remember that silver maples produce multiple seedlings from their seeds that you may have to deal with in your yard. Keep a silver maple away from your home since the tree has notoriously weak limbs that can come down in wind and ice storms, damaging roofs and gutters if overhanging a house. Plant a silver maple in any type of soil as long as it does not possess a high pH. This is one of the tree’s greatest assets—the ability to take hold in an assortment of soil types. Silver maples will withstand pollution, drought and flooding, making it a tree suitable for a wide range of settings, both rural and urban. Transplant the tree straight from the nursery and you will find it quickly establishes itself and grows quickly. Keep the ground moist during the first couple of growing seasons as the silver maple starts to spread its roots. Choose the cultivar of silver maple that best fits your needs. Bring home a Beebe type if you want leaves with deeper lobes than even the typical silver maple has, as well as drooping branches. Try Silver Cloud if you live where the weather is cold and stormy, as horticulturists designed it to be extra hardy. Avoid trouble with seedlings beneath the tree with the Silver Queen hybrid, which features leaves with a bright green upper surface and much less fruit than the average silver maple creates. Lean towards planting the Northline variety for a silver maple with wide branches.